It began with a German magazine. Or at least that's how I remember how I came to know David and Mark. What I don't remember is how many years ago this story began - 5? 7? 10 years? It seems like ages. One day Nancy called me with an invitation to go with her to dinner at the home of a new acquaintance. Nancy and David had a business relationship and when David saw a German magazine on her desk, they discovered they had both lived in Germany. It was a mild weekday evening, a Thursday sticks in my mind. David and Mark's home in Maine was a lovely antique Cape Cod nestled on a grassy knoll. As soon as we walked in, we were intrigued. Natural light filled the house and wide pine boards varnished with a high gloss ran throughout. Rooms were each a different color - lilac, persimmon, brick red, sage green; art hung on every wall, objects, furniture, books filled the spaces. At the far end of the house was the conservatory, with French doors that opened to a walled garden overflowing with perennials. You could circulate throughout the house and discover something new each time around. Introductions were made, wine was poured. While dinner was being prepared, Nanc and I curled up in overstuffed chairs at one end of the kitchen, overlooking the front lawn. We felt instantly at home. That evening we ate in the red room, which had a fireplace and was D and M's dining room during the cooler months. I'm a bit sketchy on the menu but I remember soup. Red pepper or tomato, perhaps, followed by a seafood risotto, and then something green - a salad or asparagus? Dessert was a velvety lemon panna cotta served in porcelain tea cups. Conversation and wine flowed all evening, and somehow the topic of birthdays and astrological signs came up. Coincidentally, Mark and Nanc are both Sagittarians and David and I are both Virgos. Or was it serendipity at work? Dinner that night became dinner on a regular basis, and every 4 to 6 weeks we rotated homes. Not to be outdone - or shamed - by the others' culinary skills, the menus became imaginative, thematic, sometimes paired with a movie. During an evening watching Chocolat, starring Juliette Binoche, we had to pause the movie just at the scene when she makes hot chocolate with rosebuds, so David could do the very same. By this time our group had expanded to include Rebecca and Nancy's partner, Jim. David had suggested that he invite a friend whom he thought would be a wonderful addition to our group. Who knew that the "Rebecca" he was talking about was my parents' next door neighbor for 10 years. Serendipity. This past week David and I each celebrated a birthday. He was born on August 26th, and I on the 30th. My all-time favorite birthday cake is one my mother has been making for me since I was 13 years old. 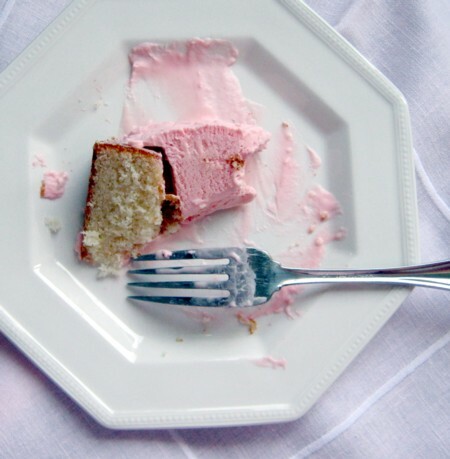 That day was sunny and hot, too, and the pink lemonade cake made its debut at a family cookout in our backyard. 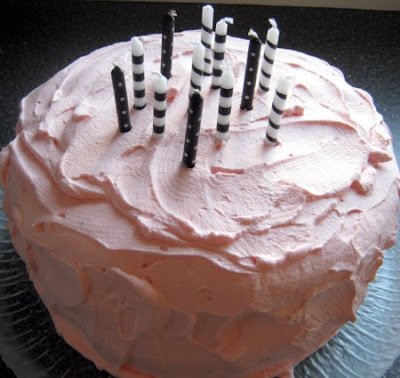 Each year, as the 30th rolled around, I'd ask her "are you making the pink lemonade cake?". She has tried over the years to mix it up a bit by making something different but I missed "my" cake and so the tradition has continued. This year, probably to my mom's utter relief (which you'd understand if you knew how old I am) I made the cake. With a middle layer of lemonade flavored vanilla ice cream, it is perfect for a summer day. It's best made a day ahead so it has time to properly freeze but so easy and refreshing that it deserves a chance to shine more than once a year. I'll save a piece for you, David! 1. Preheat the oven to 375 degrees. Prepare pans: first grease and then flour two 9-inch cake pans. 2. Into large bowl, measure all ingredients for the cake. With the mixer at low speed, beat until well mixed, constantly scraping bowl with rubber spatula. Increase speed to medium; beat 5 minutes, occasionally scraping bowl. 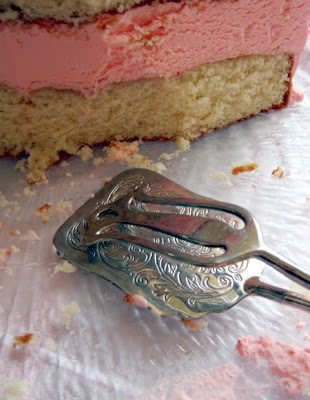 Pour batter into prepared cake pans, smoothing top with rubber spatula. Cut through batter with knife to remove any air bubbles. 3. Bake cake layers 25 minutes or until toothpick inserted deep into center comes out clean. Cool in pans on wire racks 10 minutes then removed from pans and cool completely on racks. 4. While the cake is baking, or preferably the night before, soften ice cream and quickly stir in food coloring and 1/2 of the lemonade. Spread evenly in a foil-lined 9-inch cake pan. Freeze at least 3 hours. 5. Whip cream with remaining lemonade, food coloring and sugar to taste. 6. 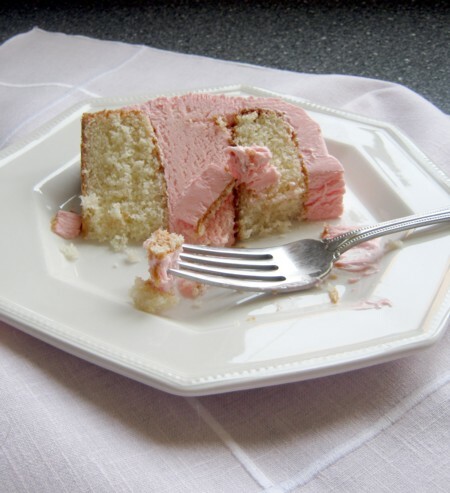 Place one cake layer on a serving plate, add ice cream layer and then second cake layer. Frost the cake with whipped cream and place in freezer until firm. Remove 30 minutes prior to cutting. This cake looks fantastic and I love hearing stories about my fabulous uncles, their cooking, and their friends. Great post! 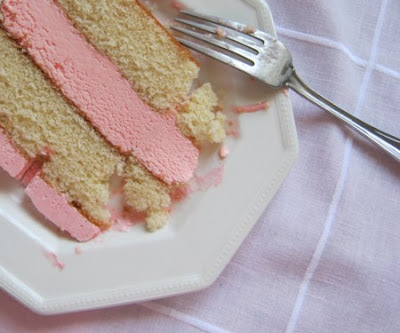 I'm always looking for new and different cake recipes to try. Saw this,tried this,loved this. I came upon your recipe for a pink cake and I had to try making it for my daughter who loves everything pink. It was a hit.Everyone loved it. Thanks so much for posting it. Happy birthday to both of you Doreen and David! Lovely story about how you met... it is so wonderful that your friendship has lasted so many years. Love the color of your cake.